My great-grandmother, Rhoda Harmon Lineberry, was one of eleven known children and the fifth daughter of Thomas Benjamin Harmon and Delilah Davis born about 1843 probably in Grayson County, Virginia, although her marriage record states she was born in Carroll County [her father was born and died in Grayson County so it would be a reasonable assumption they were living there at the time of her birth]. 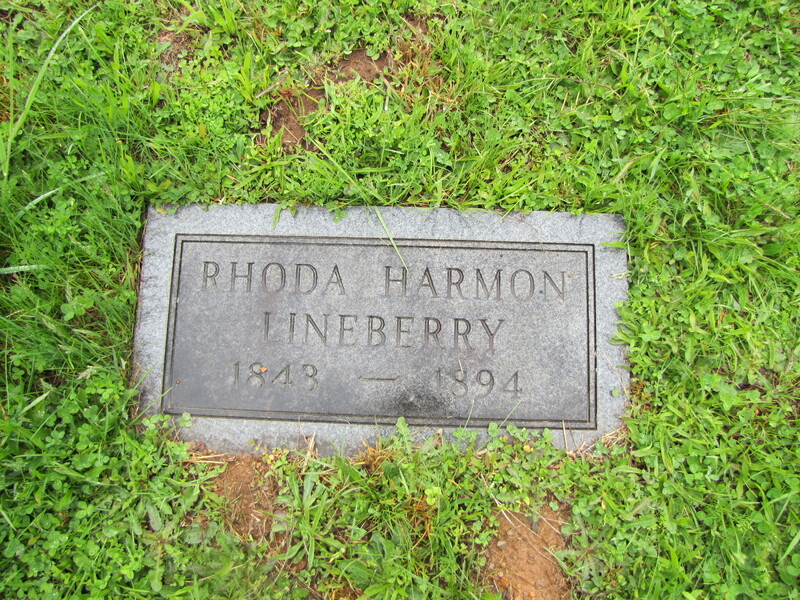 We don’t know very much about Rhoda. We don’t know her birth date, just three censuses that indicate she was born about 1842 or 1843. 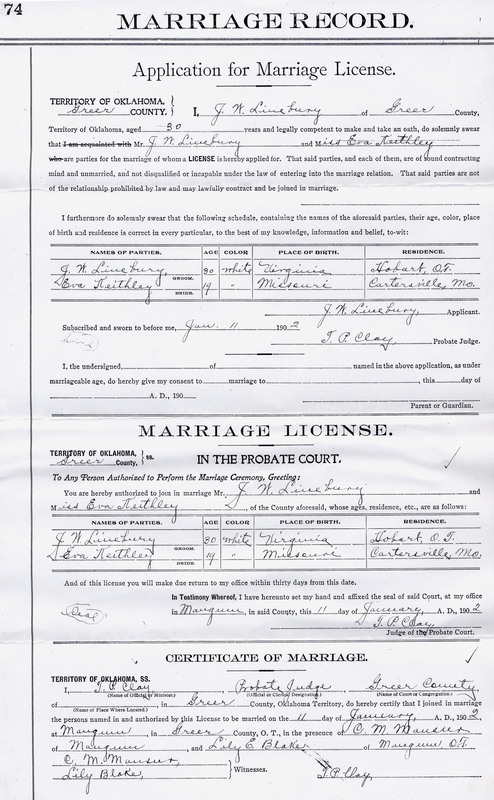 There is a marriage record indicating she married George Alex Lineberry on February 26, 1867 in Carroll County, Virginia at the age of 21, which would place her birth in 1846. Since she was listed as 6 on the 1850 census and had two younger siblings, the 1843 date is probably reasonable. The census records also indicate that, like many women, Rhoda could read but not write. George and his family had an iron forge they operated on Crooked Creek as well as farmed the land on the hills that overlooked the creek. 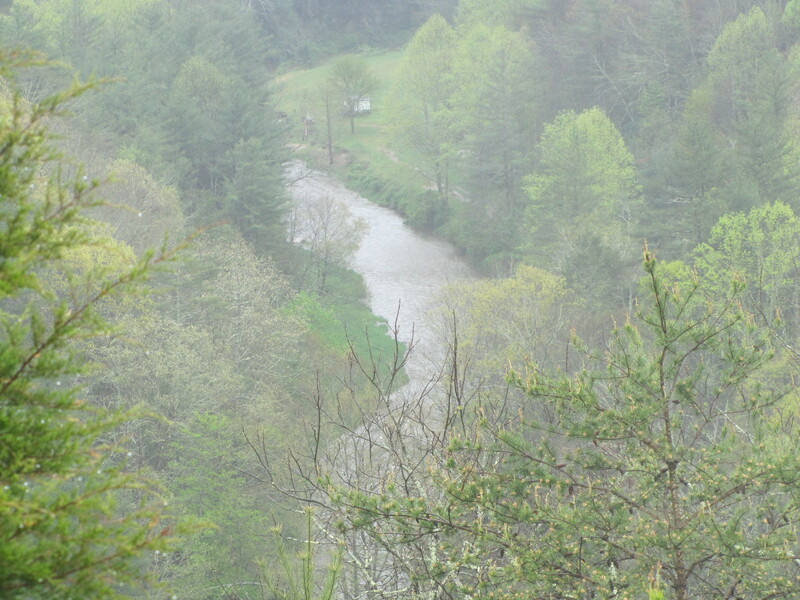 My daughter and I took a trip back to Carroll County in May 2013 and walked part of the family’s land; it was a misty, overcast day, but I was able to take a zoomed-in picture of Crooked Creek below their farm land. A death record indicates their first child, a daughter named Nancy, was born January 15, 1868 and died January 31, 1868, having lived sixteen days. By the 1870 census, George and Rhoda had a second child, son Leander Francis born in 1869. Four more children were born between 1870 and 1880: my grandfather, Jacob Wesley in 1871, Dillie Viola in 1873, Thomas Allen in 1875 and Piety Catherine in 1878. Another death record identifies an unnamed child was born and died September 8, 1872. The next few years brought more children: Callie Dora in 1881, Linnie Ann in 1883, and George Alexander in 1885 – ten children in all. The majority of the 1890 census was destroyed by fire so there is no record listing Rhoda with these children. 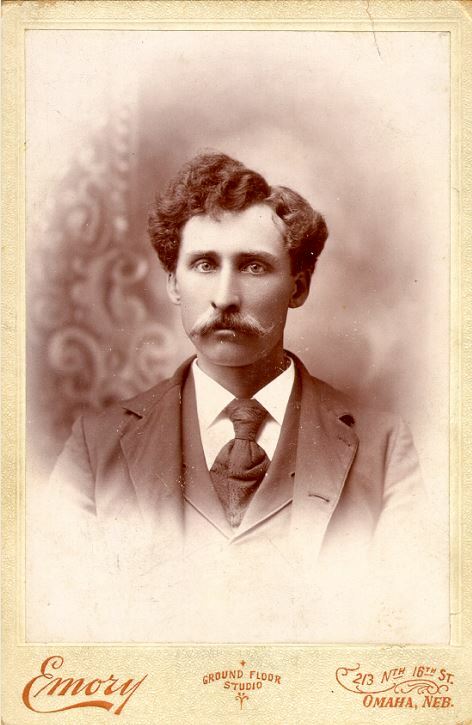 My grandfather, Jacob, left home about 1894 and moved to Missouri joining other Lineberry and Harmon relatives who had moved there sometime after the Civil War. His letters back home to his brother, Leander, indicated he had left home because their home was not a very happy place and left no doubt the cause of the unhappiness was his father, George. He did, on the other hand, mention his mother in very positive terms. Kay wrote a story of Jacob’s obvious love for his mother and his grief upon learning of her death in her blog, Such a Good Mother. My great-grandmother, Mary Jane Buckner, was born January 20, 1856 in Alabama as the first child of John Buckner and Nancy M. Foster. There is no specific record of her birth although I believe her birth date was listed on a family group sheet prepared by my aunt and mailed to my daughter. While its accuracy is unsubstantiated it is likely true. Mary Jane’s parents married in Blount County, Alabama in 1855 but had likely moved to Fayette County by the time of her birth, as had several members of both the Buckner and Foster clans [Blount County land ownership maps of the time show their families were neighbors]. We have found very little surviving information about her. A marriage index and three census records comprise all we know of her life. The 1860 census (above) for Fayette County, Alabama lists her as Mary (4) along with her parents and brother, William (2), and sister, Sarah (four months). It was quite a messy process to find the next record for her life. I did not find this family as a unit in the 1870 census and had to undergo vigorous searches for clues in order to find them. 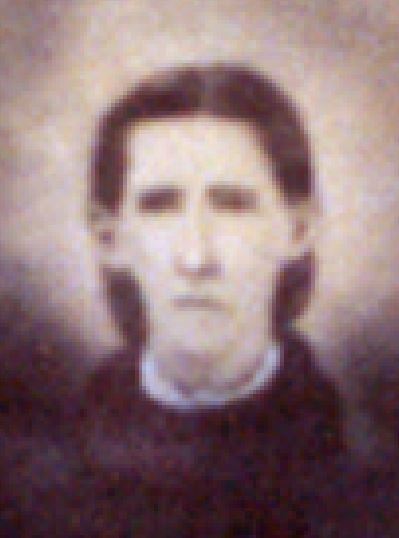 After months of searching and interpreting what I found, I was finally able to conclude that John Buckner had died in 1862 of illness during the Civil War, when Mary Jane was 6. The 1866 Alabama state census, which only lists the name of the head of household and provides tic marks for other members of the household, showed the proximity of Nancy Buckner to Joshua Watson (enumerated with his first wife still living). Her father, Anthony Edward Foster, was also enumerated in the middle of that grouping. The tic marks are identified as follows: the first mark on the left represents William Buckner (the 2nd is the tally showing one male in the household); the next four represent Sarah and a new daughter born after the 1860 census, Mary Jane and Nancy. The right side is again a tally: 4 females for a total household of 5. The final tic mark is for a soldier who had died of sickness in the Civil War. Fires at the Fayette County Courthouse destroyed many records. Betty C. Wiltshire managed to assemble a partial index of marriage partners and dates and occasionally the name of the person who performed the ceremonies, which she published in a book. Some of those marriages have also been listed on a rootsweb site for Fayette County; both Nancy Foster Buckner and Mary Jane Buckner are included in those marriage listings. Following the death of his wife, Phoebe Watson, in October 1867, Joshua married Nancy Buckner in January 1868. The 1870 census, although I found it, provides confusing and erroneous information. Much of the 1870 census only lists the initials of household members. Joshua Watson was listed by his full name, which enabled me to find the record. Nancy was listed by initials so it took the additional information on the four Buckner children to ascertain this was the correct family, especially when M.J. [Mary Jane] was enumerated by initials as a 12-year-old male rather than a 14-year-old female. The record also had to be combined with other records to discern that brother William’s middle name was Rufus, and that the additional daughter born following the 1860 census was Medora. The marriage record for Mary Jane Buckner and J. F. [James Franklin] Willis states it took place in the home of Joshua Watson on July 14, 1872. The 1866 Alabama census page from which I clipped the section showing Mary Jane’s family also listed J.F.’s mother, Amy Willis with a tic mark representing J.F. ; in other words, they were neighbors. The 1880 census shows the household still led by Amy Willis, J.F.’s mother, as co-housekeeper with Mary Jane. By June 1880, J. F. and Mary Jane had four children: Zildia (6), Margaretta (5), John William (3) and Rufus (1). By the 1900 census, J. F. was still living with his mother and his younger children but listed as widowed, and the 1900 census for Mary Jane’s mother, Nancy Watson Saling, supported the information that J.F. was widowed in the indication that two of Nancy’s children had died. Although Mary Jane was not listed on the 1900 census, we do learn the names of her two additional children, Hamp (my grandfather) and Tommy, born in 1881 and 1883. I’ve never been able to find information on Zildia; perhaps the reference to papa’s [John William Willis] sister was an indication that Zildia had died young and was never mentioned in Margie’s hearing; I presume the sister referred to was Margaretta who died sometime between 1901 and 1910. The indication that Grandma Willis died when she delivered a daughter may be an indication there was a child born after Tommy, perhaps around 1885 or 1886, that was a daughter and may pinpoint a more precise death date for Mary Jane. Although we have a small number of pictures of J. F., we have found no pictures of Mary Jane, no records of her death and only family tradition to identify her burial location at Old Mount Lebanon Baptist Church Cemetery, the family’s local church. We would relish hearing from anyone whose family stories and photos might shed light on the life and character of Mary Jane Buckner Willis. Although I hadn’t intended to write about my maternal grandfather, Jacob Lineberry, because my daughter, Kay, has written about him and I have included him obliquely in posts I’ve done, today would be his and Eva’s 112th wedding anniversary. So for the second in the series proposed by Amy Johnson Crow of No Story Too Small – 52 Ancestors in 52 weeks, I will write about what we surmise about their marriage from a number of sources. Jacob Lineberry was born in Carroll County, Virginia on May 12, 1871 to George Alex Lineberry and Rhoda Harmon Lineberry as their third child. His life was short; he died on October 31, 1915 when he was only 44 years old. Jacob left Virginia in 1894 when he was about 23 to join others from his community who had moved earlier to Missouri in the area of Linn County. We discovered in 1998 that Jacob had written a number of letters back to Virginia over the years and about 50 of them had been kept by his older brother, Leander. My cousin, Billy Ray Lineberry, had received the original letters from his father, Leonard Lineberry, and he allowed Kay to make copies of them while we were on a family visit/research trip. These letters gave us a good bit of insight into his character, hopes, dreams, frustrations and hurts. “Well Leander I can not tell you how sorry that I am about Thomas and Papa. It looks queer that the old gent cant get along with his children what does he expect to become of himself does he ever expect to die or not I would like to know; If he does where he will find himself. I lived in a racket and fuss all my life till I left Home I did not know how civilized people done. but I am trying to make my life happy now as possible but still I am not as happy as I would be if I was at home and could get along but know I could not and for that reason I will not come back home for a while. I would be ashamed for our relatives to know in this country how Papa does his children. … Leander try to be as a father amongst your children not a brute. You know while I was at home that Papa was always mad and acted as though he would rather that I was in some other country and I tryed to do as he wanted me to. and I think I can make a living any where that I try to stay. If I live I expect to get married some time and if I die soon I hope I will be in peace with the heavenly Father and will have money enough to put me away. Try to live this way your self Leander and wish Papa would try and do better. you and Thomas and the rest of the children feels near to me though you may be far away and still be near. I dont like to hear of any of your being mistreated I hope Papa will try and be as a man. If he only knew my thoughts and would listen to me he surely would be better. None of the letters that have survived have a mention of any girls he may have dated while in Carterville. About as close as he came to suggesting there might have been girls in his life was as quoted above, “I don’t expect to marry soon. I have no girl that I depend on as a friend …” and only the references to the girls back home in Virginia lend any clue that he might have a desire to marry and have a home and family. Perhaps his view of marriage based on his early home life didn’t encourage him to take such a step. In a November 28, 1900 letter, he told Leander he was still in Carterville though he had been trying to leave. He had some interest in some mines as well as a piece of equipment that was being rented out for use in the mines and a part of his desire to leave was due to the promise of free land in Oklahoma. The dates for the next land lottery was not yet set and he was awaiting that time before leaving. On an undated envelope , Jacob wrote that he was anxious to leave for Oklahoma Territory and a letter dated October 23, 1901 was written from Hobart, Indian Territory and stated he had left Missouri two months earlier. In that letter, he indicated he couldn’t stop writing and wrote up and down the sides of the letter and even wrote on the outside of the envelope after it was sealed. He said he wanted to tell Leander everything he could think of; however, there is no mention of any girls or women in his life and this is only little more than two months before his marriage. My grandmother’s 1902 marriage announcement. In a letter written December 29, 1901, Jacob finally mentioned a female in his life: “I would surely be glad to see all of you but I cannot afford it as I spend too much money now going from place to place as it is time for me to come to a stop. Well I forgot to tell you that wife would be down in a short time as she is in Mo but I expect her here in a short time and we will try housekeeping for the first time to ourselves but I hope we will not starve, but I am anxious to get me a claim here” This is the only mention of Eva in any of his letters and it only mentions her in passing and without a name. Perhaps, that is evidence that there are some missing letters in which he at least mentioned her by name, but considering we have about fifty of his letters, I suspect we have a fairly good sampling of the things he wrote about. As I mentioned when I wrote about Eva, she must have gotten pregnant in late August just days before Jacob moved away; every letter to his brother indicated he expected to not return to Missouri. With this information and little else to go on, I suspect Eva was left to track him down in order to let him know of her condition. From the off-hand way in which he mentioned her in his letter, I also suspect the marriage was more the result of a sense of duty and responsibility than of an undying love or emotional attachment to her, although referring to her as wife rather than Eva is likely an indication he was at peace with the decision to marry and was already thinking of her in that role as he prepared a place for her and their future child. Jacob apparently either met Eva in Mangum, Oklahoma or joined her on the train at Hobart and accompanied her to Mangum so they could be married [Mangum is the county seat of Greer County, the next county to the west of Kiowa County, which is where Hobart is located. It is possible since Hobart was only about four months old there was no place yet established to get licenses to marry.] In a letter written fifteen days after his marriage, he still mentioned nothing of his wife or his marriage. He mentioned he had bought a house and reflected on the probability that had he married several years ago in Virginia he would likely have had a nice house by now. Although it is hard to discern much about their relationship from the few mentions he made of his wife and even of their children in his letters, it would appear that, though the marriage was not likely a planned event, Jacob made a commitment to Eva and to their children – seven of them all told. In a time period where many photos made the people appear to be sad or angry, all the pictures we have of Eva during the time of her marriage to Jacob show her smiling and that seems to me to be a tribute to any man. To read my daughter’s stories about Jacob, see Lineberry Legacy, Jacob and Eva, and Hallows Eve 1915. Amy Johnson Crow of the No Story Too Small blog has issued a challenge to write an ancestor’s story once a week for 52 weeks. Since that seemed to be a way to honor my word of the year – intentional – and my interest in family history, I decided to participate. Although I knew almost all my aunts and uncles, I never knew any ancestors: my maternal grandfather died in 1915, my maternal grandmother in 1922, my paternal grandmother in 1938 and my paternal grandfather in 1942 (although he likely had met me, I have no recollection of him since I was not quite 2 when he died). Fortunately, my daughter chose to become our family historian and to learn everything she could about her ancestors. Without Kay’s interest, I may never have even heard my grandparents’ names, let alone know anything about their lives. 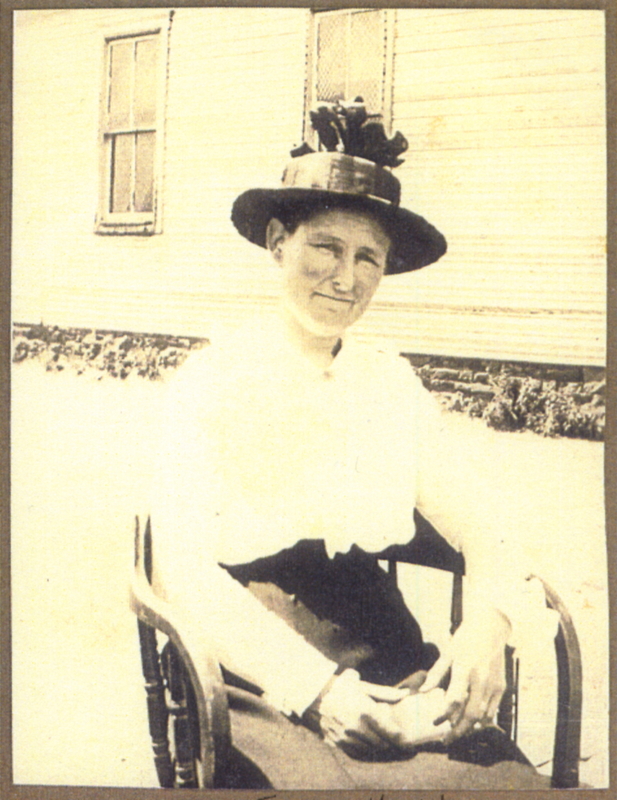 My grandmother, Eva Keithley Lineberry Fox, died five days after her 39th birthday – 18 1/2 years before I was born. Because her younger children, ages 7 to 14, were dispersed from Oklahoma to Virginia to live with various paternal relatives and because my mother was the youngest child, I do not recall ever seeing anything belonging to Eva – even a photo of her. Sometime between 1884 when Leo was born and 1889 when Mabel was born, Joseph and his family moved to Carterville, Missouri, which is in Jasper County. 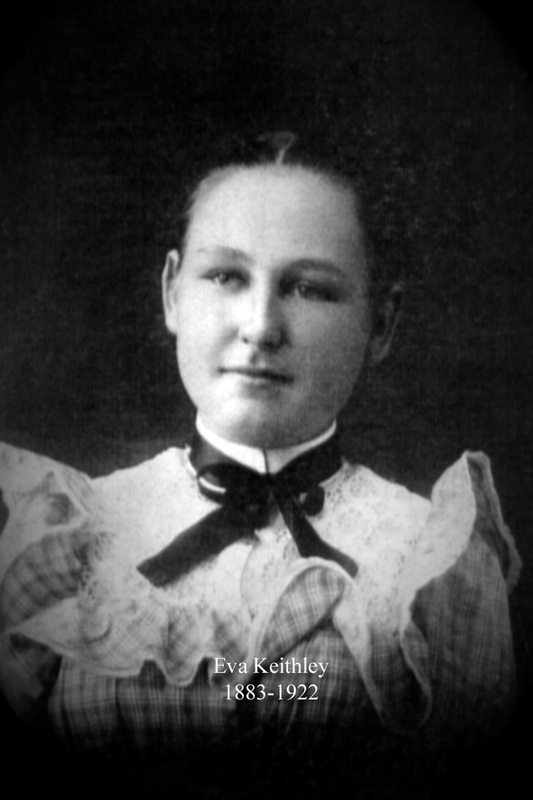 Kay received a photo of Eva taken about 1898 when she was about 15. 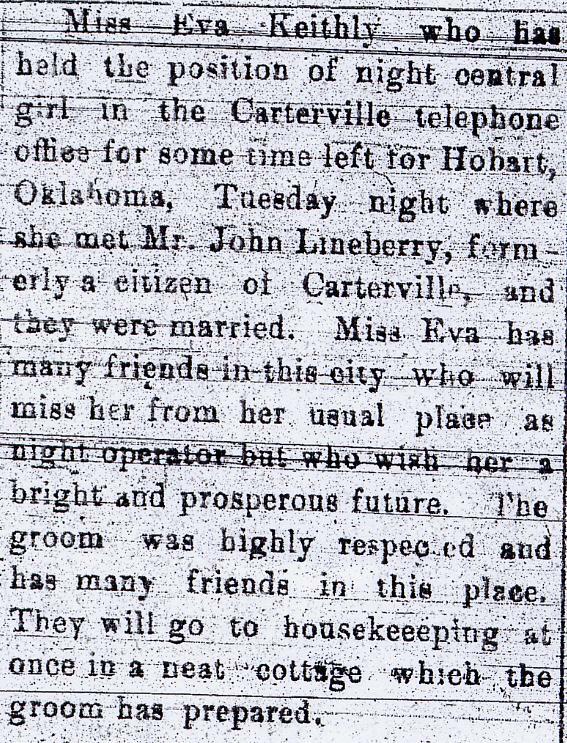 Jacob had also been living in Carterville at the time of the 1900 census; he was a boarder in a home about three blocks from Eva’s home. In 1992 we received copies of about 50 letters Jacob had written to his brother in Virginia from 1894 until his death in 1915. Those letters indicated Jacob had left Carterville in August 1901 to go to Oklahoma to see if he could get some of the land being offered in land runs. In January 1902, Eva married Jacob Wesley Lineberry in Mangum, Oklahoma, apparently at the Greer County courthouse. When we found the marriage record for Jacob, we noted the date of January 11, 1902 was just five months before the birth of their first child, William Siebert Lineberry on May 12, 1902. On a research trip to Jasper County, a review of newspapers for Carterville mentioned the town held a huge three day party in August 1901 hosted by the mine companies in the area. Past and present miners had been invited to come stay at the small community lake’s recreation area and to camp on the grounds and Jacob had been affiliated with the mines. There was camping, picnicking, bands and dancing and games for three days. The combination of the community’s party atmosphere along with Jacob’s impending departure likely resulted in an unplanned pregnancy. On the same trip to Jasper County, we found a newspaper notice of Eva’s impending marriage. The article indicated Eva worked as a night operator for the telephone company. With a 21st century mindset, it is difficult to imagine how an 18 year old in 1902 would have coped with a pregnancy when the soon-to-be father had moved away, particularly to the more uncivilized parts of our country that had yet to become a part of the United States. We have evidence that Jacob wrote letters, so perhaps he had written to Eva once he arrived at his next residence thus giving her a way to contact him by mail to let him know of the pregnancy. It’s also possible she knew enough of his location to be able to use her telephone access to get word to him. However she managed to contact him, they agreed to marry and Eva set out alone and five months pregnant, presumably riding by train from Joplin through Indian Territory to Hobart, Oklahoma in the middle of the winter; the railroad and depot for Hobart had only been recently completed. At this time in our history, decent women found it difficult if not impossible to enter dining establishments without a man to accompany them. This would mean Eva likely had to take enough food with her to sustain her for the trip. In January a couple of years ago my brother, sister-in-law, daughter and I drove a route similar to the one the train she rode would have taken; the view out her windows would have been mostly a barren flat expanse of nothing. As I looked out my car window, I wondered if she were terrified or excited, filled with hope or near despair or a combination of all those emotions. After their marriage in Mangum, Jacob and Eva returned to the town of Hobart, a town that was non-existent until August 6, 1901 when the lots were drawn. Jacob had missed the deadline to file in El Reno for the lot drawing but arrived in Hobart shortly after the town was established and where his carpentry skills were in demand to build everything. Jacob purchased a lot and built and prepared a small house to bring Eva home to. Willie, their first born, was one of the first babies born in the town of Hobart. Their first daughter, Bernita, arrived in May 1904. They sold their property in Hobart about 1905 and moved to a town first known as Greeley, then Capitol Hill and then the Capitol Hill area of Oklahoma City. They had five more children in that community: Johnnie in 1906, Leonard in 1908, Joseph (Joe) in 1910, George in 1912, and my mother, Virginia, in 1914. Sometime around 1913 Jacob bought a feed store with a partner in Cushing, Oklahoma and was living and working there a good bit of the time while Eva and the children remained at their home in Capitol Hill. His letters to his brother indicated he was unhappy with the way his partner did business and was hoping to sell the business there and return to his family. Late in 1914, Willie got typhoid fever and Jacob left Cushing and returned to their home to help Eva take care of Willie and the others. After Willie recovered, Jacob returned to Cushing still with the intent of selling the business. In 1915, Jacob developed typhoid fever and on October 31, 1915, he died leaving Eva a widow with seven children. James Edward Fox was a man who had worked with Jacob. On December 5, 1916, Eva married Mr. Fox. Following their marriage in Washington County, Oklahoma, they established a home in Oilton, Oklahoma. Once again, Eva was pregnant and their daughter June Evelyn Fox was born in June 1917, followed by the birth of Arthur Ronald Fox in 1919. In December 1921 when Eva was near term in her tenth pregnancy, she and James had a huge quarrel. My mother ran to hide in a closet but she heard their argument. She said her mother shouted at Mr. Fox and said, “I hate you, and I hope I die and I hope this baby dies.” Shortly after that Eva went into labor and during the delivery process, she had a stroke and went into a coma. Albert Edward Fox was born December 21, 1921. He soon developed pneumonia and died on January 1, 1922. Eva never awoke from the coma and died on January 12, 1922. Albert and Eva were buried in the same plot at Highland Cemetery in Oilton, Oklahoma. 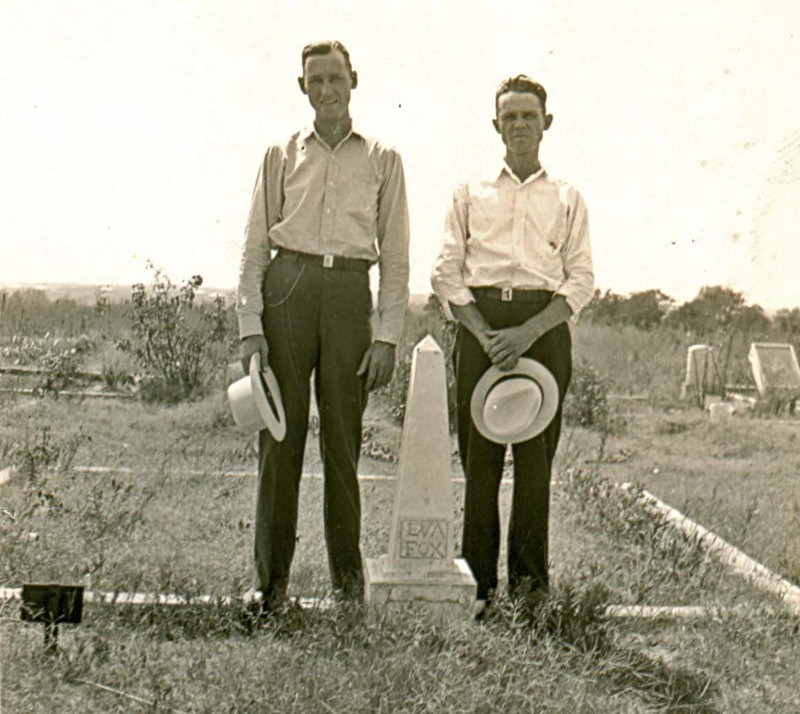 The picture to the right is of two of her sons, Joe and Leonard, standing on either side of her tombstone. *My daughter and I have written other blogs on our attempt to adequately identify Eva’s mother – including being confident of her last name. Here are links to other blogs regarding Martha Ann Conn: a blogging challenge in which I wrote about Martha as our brick wall and three blogs written by Kay: Matrilineal Line for Saturday Night Fun ; What’s Martha’s Maiden Name; and The Conn Case.